I am linking up for the Five Minute Friday. The FMF is hosted by Kate Motaung on her blog Heading Home. Today’s prompt is “Hope.” Write for five minutes; unedited. I have been replaying these words in my mind ever since I heard them especially as I look at the events in Charleston, racism, etc. It is extremely difficult to find the light in the midst of these situations. And then I look at the world around me. I see hope in plants growing up in the soil. I see hope emerging from the children around me. “For a little child shall lead them.” I see hope as 30,000 youth and adults get ready to emerge on the city of Detroit for the ELCA National Youth Gathering. But even though I see this hope, sometimes (ok more often than I or any of us care to admit), it is almost impossible to spot. Where is hope in the midst of the world’s events? Where is the hope as we watch so many struggle with a mental illness, with cancer, with…..? Where is hope when ISIS continues to steal away so much from so many? In these beautiful words, I see HOPE; a hope that only can be given to us by our dear savior. This entry was posted in Uncategorized and tagged Desmond Tutu, ELCA, Five Minute Friday, hope, Youth Gathering by tara.ulrich. Bookmark the permalink. When the world dials 911, a Marine answers. Yes they do, my son included! Thank you for your selfless service. Indeed! I am so thankful for our military. My AF husband has also served in the wars. Thanks Andrew, Carrie, and Bringbread! Oh I love that quote! 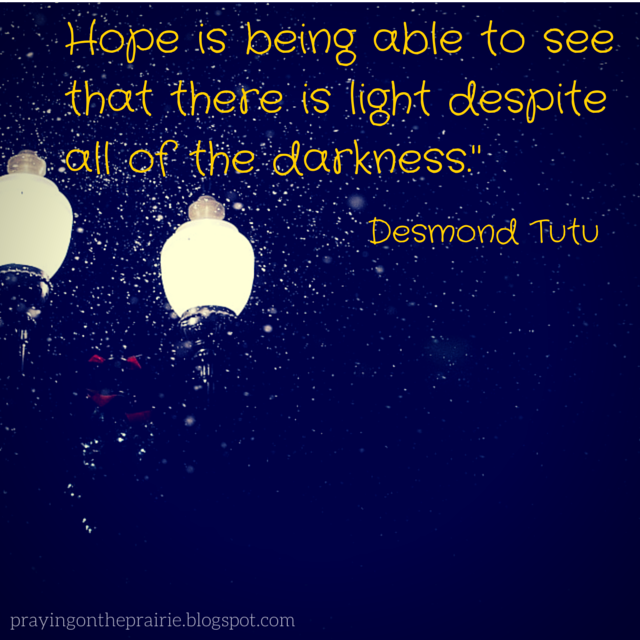 I am so thankful that Hope is always near… always available… always offering glimmers of Light! Me too friend! Me too! Yes ma'am! Our hope… is only in Him. Nope the news is not at all the place to find hope for sure. Yes, our hope is found in Christ alone. When all else fails, we can rely on our Savior for the hope we need to get through these tough times. Thank you for that quote as well. It's easy to get caught up in what is going on around us and forget that God wins in the end. Thanks for sharing today, Tara! Yes Carrie, for sure! Thanks for stopping by friend! Tammy, it is indeed all about Jesus! Beautiful post, Tara. I love this: "Our hope comes in the form of this holy one who isn't afraid to turn the world upside down and sit and break bread with tax collectors and sinners." He is so good to us! Thanks Tasha. Yes indeed he is so good to us. And that line is one of my faves in this post as well.